I've had a love affair with dates ever since my fourth grade teacher brought some to our Fairlawn Elementary School* classroom, covered each with a generous sprinkling of powdered sugar (as if dates need more sweetening!) and invited us all to try one. Never had I tasted anything so exotic and delicious. It made all my trips to the local penny candy story for Lemonheads and Smartees seem so, well, juvenile and one-dimensional. I begged my mother to buy a box and I've been enjoying all varieties of dates (medjoul are my favorites) ever since. Sometimes I buy too many -- hence another date recipe, this one a "date newtons" or date sandwich cookie. 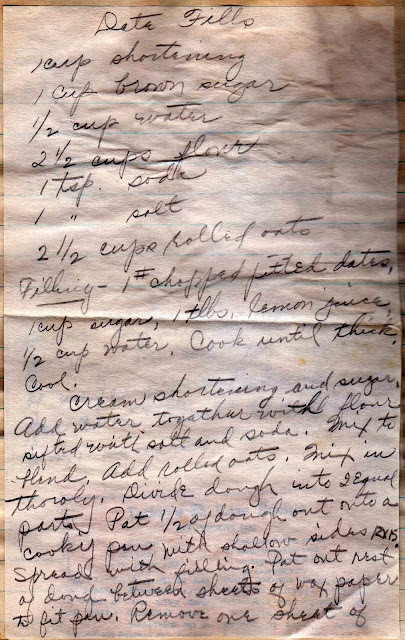 This recipe is from an Amish collection I purchased recently on eBay, a collection filled with the most wonderful confections. Here, they are called date fills, but they often go by the name date sticks. It seems that almost every recipe box or notebook I have, most from 1910 to about 1960, have at least one version of this cookie. Date fills are not super simple to make, but so worth the effort. I prefer to buy dates with their pits intact which adds another step, but you can buy pitted dates. Make the filling first. Pit and chop the dates, and cook them with water, sugar and lemon juice. You will soon have the date paste for the filling. 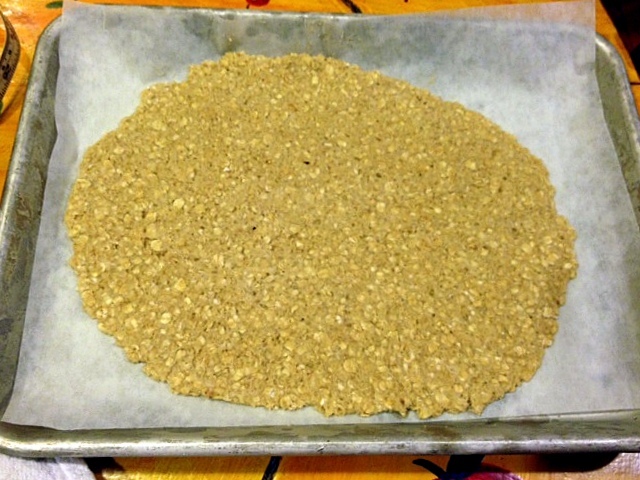 The butter, sugar, flour and oats dough is easy to put together. 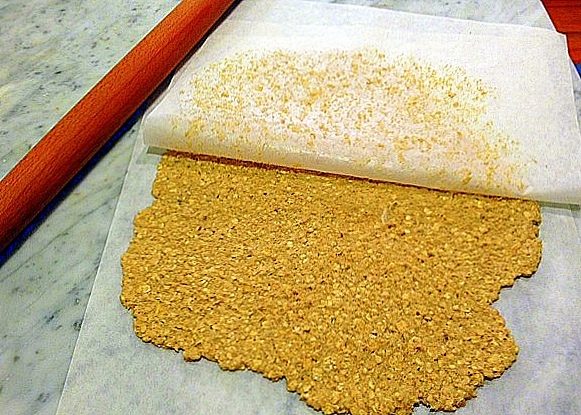 Roll it out between two sheets of parchment or wax paper. Plastic wrap might work well too. Place the rolled pastry on a baking sheet and spread the date filling on top, a step I sadly neglected to photograph. This is best accomplished using an offset spatula, but the back of a spoon and a butter knife can be employed for this task, as well. The slightly tricky part is placing the top crust layer on the date filling. As you can see, mine looks rather rustic, but that's ok.
Bake it in the oven until it's browned. When it's cooled, cut it into small squares. The uneven ends -- quite delicious -- are well-deserved treats for the cook. *Fairlawn Elementary was renamed the Judith A. Resnick Elementary School for its former astronaut alum who perished during the Challenger disaster in 1986.